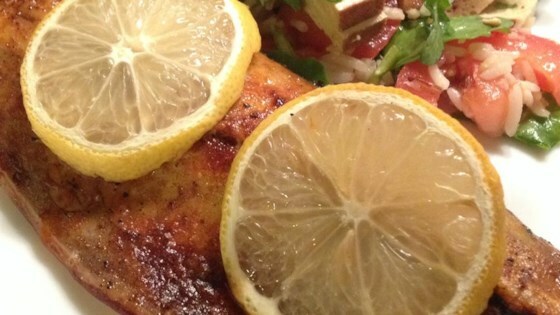 "The quick, simple, and delicious fish recipe is best with fresh-caught fish if possible." Preheat the oven's broiler and set the oven rack about 6 inches from the heat source. Lightly grease a baking dish. Rub both sides of each mackerel fillet with olive oil and place with the skin side down into the prepared baking dish. Season each fillet with the paprika, salt, and pepper. Top each fillet with two lemon slices. Bake the fillets under the broiler until the fish just begins to flake, 5 to 7 minutes. Serve immediately. Quick and easy tilapia fillets are broiled with a creamy Parmesan crust. The olive oil and lemon added just enough flavor. The broiled lemon was an excellent idea. 4.5 stars!!! Delicious! The perfect amount of seasoning - you could still enjoy the flavor of the fish. Holy Makerel! Simple and yummy. Bonus - makerel is a sustainable fish.